Like me if you are a frequent google user you must have seen that now google is doing some interesting and fun things regularly. We see new “Google Doodles” (those interesting images and graphics that appears on google homepage in place of normal google logo) more often. Some other fun stuff is also there that is not so obvious. 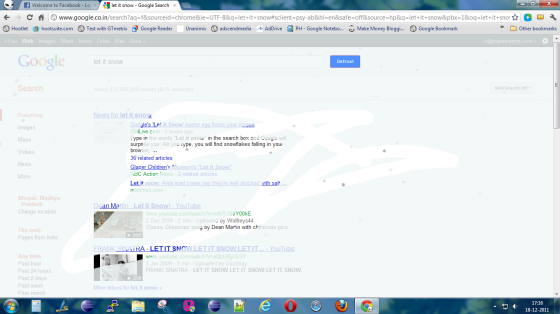 Go to google and search for the phrase “Let it snow” you will see some interesting thing happening on the screen. Snow will start to fall from the screen top and after a few seconds frost will appear on your screen that covers the whole screen. You can wipe the frost with your cursor. Or you can click on the defrost button to clear it all at once. 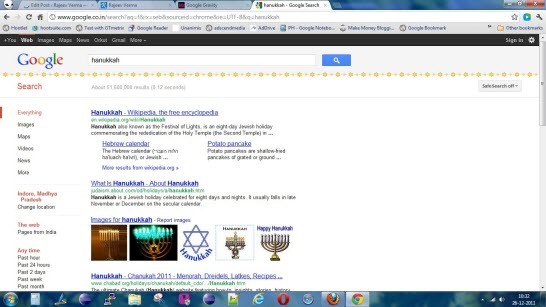 Google is celebrating hanukkah this festive season. If you search for the term “Hanukkah” you will see a band of star appear below the search bar. I know this is not that interesting but still its something google is trying to spread joy of festive season. Google gravity is a special experiment that is really interesting to see and I am confident that you are going to enjoy it very much.